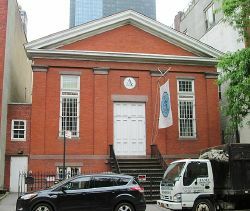 The Actors Studio is a non-profit organization for professional actors, theater directors, and playwrights located in the Old Labor Stage at 432 West 44th Street in the Hells Kitchen neighborhood of Manhattan, in New York City. Founded in 1947, by Elia Kazan, Cheryl Crawford, and Robert Lewis, it has produced notable talent such as, Marlon Brando, Robert de Niro, Norman Mailer, Eli Wallach, Sidney Poitier, Edward Albee, Marilyn Monroe, and James Dean. The Studio is best known for its work refining and teaching method acting, especially after being headed by its charismatic, although controversial president Lee Strasberg, who took over in 1951. The "method style" of acting, as it came to be called in the United States, was an approach to acting, based on the innovations of Constantin Stanislavski, and developed by the Group Theatre in the 1930s. Method acting was further refined by Strasberg and others who sought to break with the traditional and more formalized conventions of nineteenth century theater. The primary goal of the Actor's Studio is to create an environment where actors can progress in their development and work at their craft without the constraints of commercial pressures, so that they can be free to experiment with new forms of theater. Membership in the Actor's Studio is selective and admittance can only be accomplished through an audition; however, once accepted, actors are lifelong members and do not pay fees unlike the other organizations for actors such as the Screen Actors Guild. In 1967, the west coast branch of The Actors Studio, called Actors Studio West was opened and still exists in the City of West Hollywood. In 1931, the Group Theatre was formed in New York City, by Harold Clurman, Cheryl Crawford, and Lee Strasberg with the intention of being a collective where actors trained together as part of an ensemble and there were no "stars." It was the Group Theatre that, prior to World War II, was working to develop a naturalistic technique, one that would be uniquely American, although coming on the foundation of Russian theater and the revolutionary dramatic pioneering work of Stanislavski. Group Theater, according to its founders' vision, was intended to be a base for struggling actors and actresses who aspired to do better work. During the war years, funding for the organization dried up and the group dissolved. In 1949, Lee Strasberg began his career with the Actor's Studio and in 1951, became its artistic director. It was a dynamic, sometimes controversial, collaboration that would flourish until his death at age 80, in 1982. The first Broadway success for The Actors Studio Theater was its production of Eugene O'Neill's Strange Interlude. Ellen Burstyn and Al Pacino were named co-artistic directors of the studio in September 1982, seven months after the death of Strasberg. Pacino resigned in 1984. In the late 1980s an atmosphere of stagnation began to set in as the leaders grappled with complaints from members that the studio lacked a coherent program. Things came to a standstill in 1987, when workshops were suspended. In 1988, Frank Corsaro, for more than two decades a director at the New York City Opera, became the new artistic director at the urging of Paul Newman, its president. As a result, the financially struggling Actors Studio added more than 100 new members, opened up its famous "sessions" to diverse stylistic approaches, presented workshop productions for invited audiences of nonmembers and revived the dream of a full-fledged Actors Studio Theater. He became the first full-time, salaried artistic director in the history of the studio. His mandate was to emphasize the production of new work, something with which the studio had only limited success with over the years. In the early 1990s, the Studio found itself with a vastly expanded budget, $450,000 in 1994, that was no longer being provided by one source. The task of raising funds began to eat up too much of the executive committee's time. In 1994, The New School came to the rescue, announcing the beginning of a three-year master of fine arts program in theater arts, administered by and offered at the New School but with a curriculum created and taught by Studio members. Selected students were permitted to attend Tuesday and Friday sessions at the Studio. The Studio director at the time, Arthur Penn, said that without the New School program, "the Actors Studio is, I'm afraid, struggling in a fairly terminal illness. The financial handwriting is on the wall; to succeed and survive, smaller cultural organizations have to affiliate." From September 1994 through May 2005, the Studio collaborated with The New School in the education of masters-level theater students. In 2005, New School President, U.S. Senator Bob Kerrey, chose not to renew a contract with the Actors Studio, ending the collaboration and causing controversy with students who enrolled at the school under the pretense that they would be a part of the prestigious program. At least some of the controversy and parting of ways may have had to do with the television program being filmed at the school called Inside the Actors Studio; a program which received some criticism for its choice of interview subjects and style of interviewing. The television program, air on the cable television network Bravo. Hosted by James Lipton, Dean Emeritus of the Actors Studio Drama School, it provides in-depth interviews with actors, directors, writers, and other artists, some of whom are members of the Studio. The program is taped in front of the students of ASDS, and served as a class seminar for them, until the school's dissolution. Beginning with the twelfth season, in the fall of 2005, Inside the Actors Studio started taping at the Michael Schimmel Center for the Arts at Pace University's New York City campus. It has won numerous Emmy Awards and is the network’s longest-running original series. It also received two CableACE Award nominations for Best Talk Show, winning in 1997. In 2001, the show won the Golden Angel Award for Excellence in Media for Best Interview Show and in 2002 was awarded the Gold Medal as the World's Best Talk/Interview Program by the world's largest international television competition, the New York Festivals. Since the fall of 2006, the Actors Studio has offered a three-year MFA degree program through Pace University. Some actors still regard the Method as a subject for ridicule. In his book, On Acting, Laurence Olivier advises young actors to "work on a building site rather than go to a 'method' studio." And Philip Bosco, an American actor who specializes in classics, has said, "The greatest disservice to American theater and the tradition of American acting has been caused by the prevalence of the Actors Studio." Theater pioneer, actor, and director, and a co-founder of the Moscow Art Theatre at the turn of the century, Constantin Stanislavski was responsible for grounding breaking work that united the art of acting with psychological realism and expressionism that was finding voice in the twentieth century fields of drama, art, dance, and literature. Stanislavski developed his inner psychological methods in response to François Delsarte's (1811-1871) acting style that attempted to connect the inner emotional experience of the actor with a systematized set of gestures and movements based upon his own observations of human interaction. This Delsarte method became so popular that by the 1890s, it was being taught throughout the world, but particularly in America. Unfortunately, Delsarte never wrote a book explaining his method firsthand, so many teachers who did not fully understand the emotional connectivity that Delsarte originally had in mind and as a result the method devolved into melodramatic posing. The Stanislavski Method of Acting formally replaced Delsarte's style in the late 1930s. Stanislavski felt that tension was the "enemy of the actor." Strasberg, building on this idea, developed various relaxation exercises and techniques that while borrowing from the techniques of Stanislavski were also unique to his own methods. The further refining of this method was soon to be called in America "method acting." Method acting uses various techniques to put an actor in touch with emotions when developing a characterization for a role. Actors learn to use relaxation techniques, sense memory (recall), concentration, the "magic if," substitution and even animal imitation exercises. Strasberg believed that an actor must be reconditioned to function in a state of relaxation. "If there is tension, the actor cannot think or feel. Tension is the occupational disease of the actor. Relaxation is the foundation on which almost all of the actor's work is based. Many problems in acting disappear when the actor learns to relax. It is the actor's warm-up or preparation, similar to the athlete before an event. You see, the actor is an athlete of the heart." The first major post-war alternative theater was the Living Theater developed by Julian Beck and Judith Malina. It attempted to be more real than the realistic commercial theater represented by Method Acting. It became a purveyor of sexual and political anarchism and cultivated a raw style that was supposed to expose the lies under the the finished performances of the realist theater. Such avante-garde, counterculture, and experimental attempts at replacing the realist tradition of method acting have never resulted in a solid new school of actor training. No alternative system has been able to challenge the influence that method acting still holds in the twenty-first century. Drama, performing arts, and acting will probably always be a source of controversy for human beings who love to be entertained and, seemingly in every culture, nearly worship their entertainers. In the twenty-first century, as people seek to express deeper emotional levels and more complex roles, the art of acting does not get any easier for those that pursue this career path. Just before his death, a documentary film about Strasberg and Actors Studio debuted titled Acting: Lee Strasberg and the Actors Studio. In 1987, the film Hello Actors Studio was released, and another documentary titled, Overview for Miracle on 44th Street: A Portrait of the Actors Studio made its debut in 1991. In an article for The Guardian in the year 2000, artistic director, Estelle Parsons reflected on the mission, purpose and intention of the Actor's Studio they wanted to return to its original purpose, "We want to work toward making it … a place of refuge from the commercial world." ↑ Wendy Smith, Noises Off at the Venerable Actors Studio The New York Times, May 29, 1994. Retrieved July 26, 2018. ↑ Pace University, Actors Studio Master of fine Arts, Appserv.pace.edu. Retrieved July 26, 2018. ↑ Mel Gussow, The Method, Still Disputed but Now Ubiquitous The New York Times, April 14, 1987. Retrieved July 26, 2018. ↑ 4.0 4.1 Actors Studio, Homepage. Retrieved July 26, 2018. ↑ Don B. Wilmeth and C. W. E. Bigsby, New York Architecture Images, Nyc-architecture.com. Retrieved July 26, 2018. ↑ 6.0 6.1 Don B. Wilmeth and Christopher Bigsby (eds. ), The Cambridge History of American Theatre (Cambridge University Press, 2000, ISBN 978-0521669597), 499. ↑ San Francisco International Film Festival, History.sffs.org. Retrieved July 26, 2018. ↑ Turner Classic Movies, Miracle on 44th Street: A Portrait of the Actors Studio, TCM.com. Retrieved July 26, 2018. ↑ Michael Ellison, Stars to make Method work at Actors' Studio The Guardian, June 21, 2000. Retrieved July 26, 2018. The official web site of The Actors Studio. Theactorsstudio.org. PBS American Masters Series profile. Pbs.org. Gussow, Mel. 1997. Once-Exclusive Actors Studio Reaches Out to the Public Query.nytimes.com. This page was last modified on 5 August 2018, at 19:58.